How we choose to celebrate life’s most significant milestones, from exam results, buying your first house, to engagements, and starting a family, are all well documented and have become traditions in their own right. Hen parties and baby showers signify a right of passage and are deemed a necessary prerequisite before admission into the realms of adult life. As our nearest and dearest splash the cash celebrating our imminent nuptials and the impending reality of sleepless nights, it is easy to overlook our friends other major achievements. As the allegiance to the 9-5 grinds to a halt, and as the evolution of the working environment unfolds in front of us, many are starting to realise the potential of starting their own companies, and turning the side hustle into a full-time venture, but how exactly do we celebrate our friends entrepreneurial spirit? When was the last time you supported a friends start-up, equipping them with the tools and metaphorical tissues for those first few nailing biting months? Casting our net further in search of an answer to this conundrum, we stumbled upon Shine Registry, an American website service which hosts profiles and their founders with wedding registry-style lists of the stuff they need. Founders ask for support while they are starting their business and give their communities an opportunity to show that support in meaningful and substantive ways. From small things like spreading the word on social media, to donations of supplies and equipment, and networking opportunities, Shine represents the manifestation of practical and personal support for those just beginning their start-up journey. We caught up with Founder of Shine, Emily Wazlak, through the powers of modern day technology, to find out where she finds inspiration, why women founders are reluctant to ask for investment, and why she was moved to create a new kind of tradition. Can you tell us a little bit about yourself, you background and how your previous work influenced Shine? I grew up in Queens, New York and moved to Washington D.C. after college. My first job out of school was with the re-election campaign for President Obama, so I was able to continue working in political organizing and advocacy while I was in D.C. I moved to Pittsburgh to go to graduate school at Carnegie Mellon University and started working on building Shine Registry while I was earning a Masters degree in Public Policy and Management. The common thread in my work has been bringing people into conversations they didn’t necessarily see themselves as being a part of before. This used to be through registering people to vote and sharing information about policy issues (though I still do that and have been known to keep blank voter registration forms in my purse in case people need them) but with Shine Registry it’s about creating better support structures for people starting new ventures. 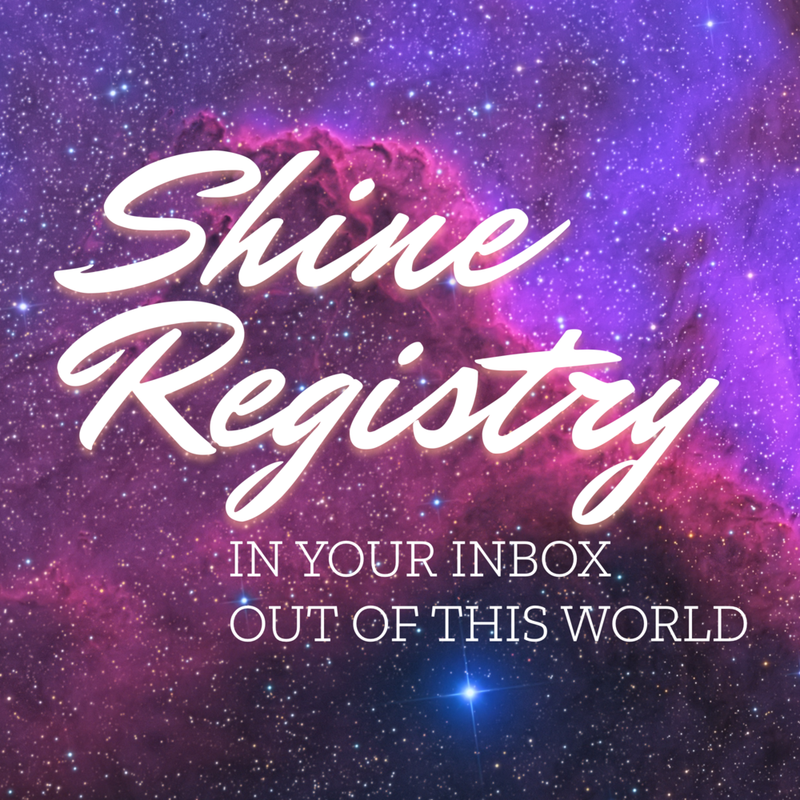 So Shine Registry, where did it all start? A few years ago my friend Emily B. was getting married and our other friend Joy was starting a business at the same time. We had so many obvious ways of celebrating Emily B - an engagement party, bridal shower, bachelorette, wedding and post-wedding brunch. It was so much fun and our whole friend group was able to show her how happy we were for her. Meanwhile, without traditions to fall back on it was unclear how we could support and celebrate Joy, and not because we lacked enthusiasm. We didn’t know how to celebrate and there were no fallback ways for Joy to ask us for support either. After that summer I started talking to as many entrepreneurs as I could find about how they were starting their businesses and how they were seeking and receiving support. I created a simple website using Google forms and convinced a few people to create registries. Everyone who was on that version of the site got what they asked for and that led to Shine Registry being able to get support from Project Olympus, the incubator program for student and faculty startups at Carnegie Mellon. Since then my friend Ashley has become involved and we’ve worked with a small team to launch an improved version of the website with more updates on the way! Creating a new kind of tradition - in business, do you think it's about reinventing yourself and your ideas? I think it might depend on the business. For us, creating a new kind of tradition means we’re shifting people’s ideas about a familiar tradition. We’re the same people that have measures for success that old traditions weren’t reflecting, but reinventing this idea is shaping the world in a way that makes more sense for us. What is the key message behind Shine for you? Anyone who has an idea can feel supported when working towards bringing that idea into reality. The business supports and encourages female entrepreneurs and their creativity - how important is that to you? Very! If we’re not actively encouraging and celebrating the work that goes into bringing new ideas into the world, especially from people that have been excluded from the narrative of creating and launching new ideas, we risk missing earth shaking work and life is less reflective of people living it. Do you think women are more reluctant that men to ask for the tools and advice they need to start a business? I think women are building businesses in a system that hasn’t rewarded them the same way it rewards men and that has affected the way people ask for what they need. There are studies on salary negotiation that show a negative impact on likability when a woman is asking for a raise. There are also studies that show men and women are being asked different questions by investors that shape conversations about getting funding. These are all things that can contribute to gender differences in how someone may approach seeking resources. It’s hard not to react to your environment and ways we’re conditioned to behave whether it’s implicit or explicit. 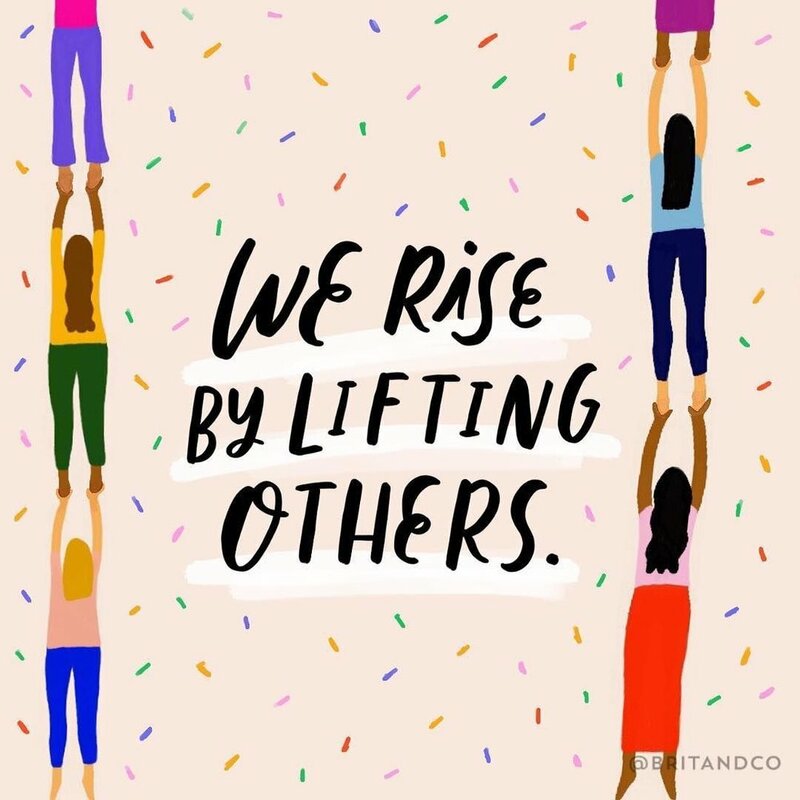 That’s why a lot of the intention behind building Shine Registry is on increasing the capacity communities feel they have to support women starting businesses - by expanding the understanding of how to support women as they start new ventures using a familiar tradition. We’re also increasing the visibility of women starting businesses so we can shift our mental model of what an entrepreneur looks like. Shine Registry is facilitating how women ask for what they need, but the environments in which women express those asks needs to be addressed too. Do you have any personal favourites when it come to the ventures that have appeared on Shine? The most exciting part of building Shine Registry is getting to meet and learn about the people creating profiles so it’s really hard to narrow it down to favourites, but here are some highlights! Georgiya was one of my closest friends from high school and the first person to create a profile on the version of Shine Registry that’s up now. That was a kind of emotional full circle moment. I met Kare Spears a few years ago and have a huge respect for the work that she’s done, building her design business from when she was still in school. She recently did our first Instagram Story takeover with a fun behind the scenes look at what a day in her life looks like. More recently, Dru sent me a note when she was asking about setting up a profile for Survivors Alliance. I was having one of those weeks where it felt like very little was going right and the warmth and kindness of her email was extremely appreciated. We’ve never met but I’m so excited that Shine Registry can help support the important work she’s doing. Where do you see Shine Registry in 5 years time? I hope by then that the gendered gaps in financing new businesses will narrow and Shine Registry can expand beyond women starting businesses - so we can celebrate big promotions, and other milestones. Yes! I’ve been involved with a group that has organized a fellowship in memory of our dear friend, Reese Neader, who passed away in 2016. It’s called the Forge Fellowship and it supports students at community colleges and public universities that are working on civic infrastructure projects in their communities. I get to meet the first cohort of fellows next week and am so excited. I also have a funny side project making coloring books. The idea is that colors are assigned based on a short survey and then a group of people each color in a section before putting the whole thing together. I have some photos up here. What is your work set-up? 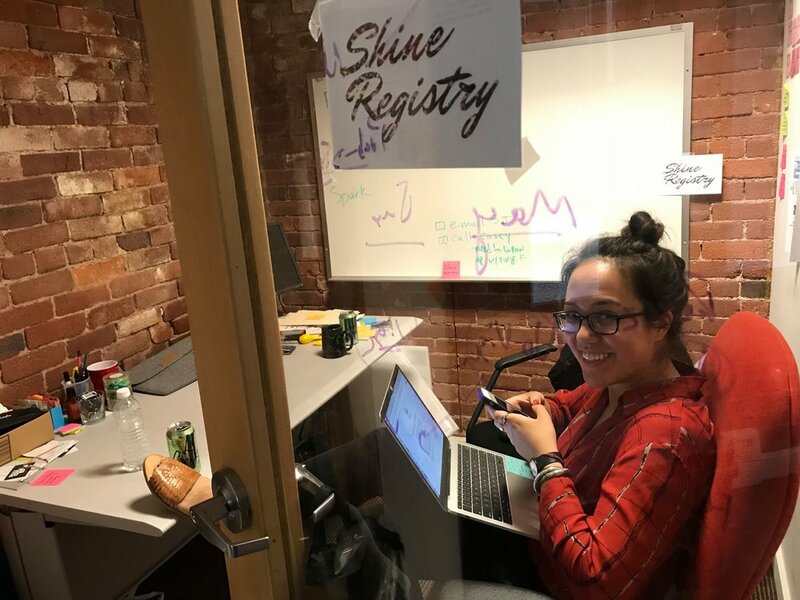 Shine Registry is a part of an incubator program run by Ascender PGH, which means we’ve received office space along with mentorship and financial support from their team. The space is beautiful but the people are by far the best part. There’s a lot about starting a company and bringing an idea into the world that can be scary and a little lonely. The community at Ascender is truly supportive and I’m very grateful for the relationships I have with folks that work there. That sense of community is reflective of the collaborative spirit in the larger Pittsburgh startup scene as well. Lately my time has been split between going over new designs we’re working on for the website, managing a lot of our social media content, and meetings with potential partners. My Co-founder, Ashley, lives in San Francisco so we’ll talk over the phone a little later in the day. If I have a meeting at Project Olympus, the incubator space at Carnegie Mellon that Shine Registry is also a part of, I factor in about half an hour for spending time with the office dogs there. Myka and Naara are a little Instagram famous and a lot of fun to spend time with in between meetings. I like to add a slice of lemon and a few big slices of ginger to a cup of hot water and drink it before I go to bed. I wish I could say I was doing yoga but that habit comes and goes too frequently to call it a ritual. Where is the best place to visit/grab a coffee where you live? This feels like a good excuse to tell my favorite Pittsburgh coffee shop story. I used to live close to a coffee shop called Arriviste and there was one month where they brought in these huge paintings that I loved. Before I moved into the house I live in now I was getting to know to my roommates and they asked where I hung out. I mentioned that I was going to Arriviste because of the paintings that they had up and it turned out the artist was one of my new roommates! You can see his work on Instagram. I also like to go to Zeke’s on Penn Avenue or the Tazza D'Oro in Gates at Carnegie Mellon. I’ve become more of a homebody lately, so I’m probably sitting on the porch of my house. My friend Erica plays in two bands and I like to go to their shows when I can. Spish plays loud music, Moonspeaker is a little quieter. What was the last thing you read/listened to/watched? I read a bunch of blogs from Man Repeller earlier today. I started listening to the new Florence and the Machine album but then listened to Lungs on repeat instead. I watch a lot of Youtube videos about baking even though I haven’t baked anything in years. My mom. She moved to the U.S. from China in the 80s and built a life here from scratch. It doesn’t get more entrepreneurial than that.